On Saturday, March 17, 2018, there will be the official unveiling of the Gold Star Families Memorial Monument at the Hawaiian Memorial Park in Kaneohe before the entrance to the Hawaiʻi State Veteran’s Cemetery. The driving force behind this monument is Herschel “Woody” Williams, a Marine, an Iwo Jima Combat Veteran, and a Medal of Honor Recipient. Woody’s vision of honoring and paying tribute to these Gold Star Families “for their sacrifice of one of their loved ones has become a reality”. Mr. Williams is the sole surviving Marine from WWII, to wear the Medal of Honor. He is scheduled to attend this ceremony. 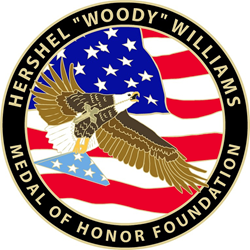 The Hershel Woody Williams Congressional Medal of Honor Education Foundation, was established in 2010 and is a charitable 501(c)(3), not-for-profit organization that pursues specific endeavors and goals through the vision of Medal of Honor Recipient Hershel “Woody” Williams. The Foundation encourages, with the assistance of the American public and community leaders, establishing permanent Gold Star Families Memorial Monuments in communities throughout the country and provides scholarships to eligible Gold Star Children. Its’ purpose is to honor Gold Star Families, relatives, and Gold Star Children who have sacrificed a loved one in the service of their country.